Dr. Nava Panitz-Cohen, was born in New York City, moved to Israel in 1974. Served in the Israeli army at the rank of captain; B.A. in Sociology and English Literature from Haifa University; B.A., M.A. and Ph.D. in Archaeology from the Hebrew University in Jerusalem. Main work experience: guide and program coordinator, Yad Yitzchak Ben-Zvi; assistant to curator, Collection Room-Institute of Archaeology, Hebrew University of Jerusalem; research assistant to Prof. Amihia Mazar; participation in the publication of the excavations at Tel Batash, Tel Beth-Shean and Tel Rehov; editor of the Qedem Monograph Series of the Institute of Archaeology, the Hebrew University of Jerusalem; adjunct instructor at the Institute of Archaeology, the Hebrew University of Jerusalem. Main field experience as supervisor: Tel Miqne, Tel Batash, Tel Beth-Shean and Tel Rehov; presently co-director of excavations at Tel Abel Beth Maacah (with Dr. Robert Mullins of Azusa Pacific University). 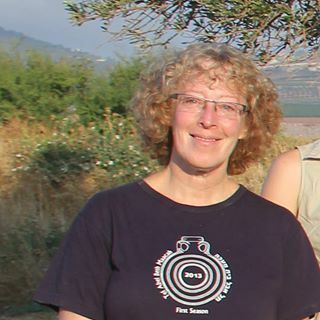 Main research interests: ceramic analysis and technology, household archaeology, gender archaeology, archaeology of borders, with an emphasis on Arameans and Israelites in northern Israel. -2004. Change and Continuity in the Ceramic Assemblages at Late Bronze Age Tel Batash. Bietak, M. (ed). Proceedings of the SCIEM 2000 Late Bronze Age Conference. Ägypten und Levante XIV: 319-337. Austrian Academy of Science. Vienna. -2005. A Salvage Excavation in the New Market in Beer-Sheba: New Light on Iron Age IIB Occupation at Beer-Sheba. Israel Exploration Journal 55/2: 143-155. -2006. ‘Off the Wall’: Wall Brackets and Cypriots in Iron Age I Israel. in de Miroschedji, P. and Maeir, A.M. (eds. ): “I Will Speak the Riddles of Ancient Times”: Archaeological and Historical Studies in Honor of Amihai Mazar on the Occasion of his Sixtieth Birthday. Eisenbrauns. Winona Lake. -2006. with A. Mazar. Timnah (Tel Batash) III: Finds from the Second Millennium BCE, Qedem 45, Monograph Series of the Institute of Archaeology, Hebrew University in Jerusalem. Jerusalem. -2009. with A. Mazar. Excavations at Tel Beth-Shean 1989-1996. Volume III. The 13th-11th Century BCE Strata in Areas N and S. Hebrew University of Jerusalem and the Israel Exploration Society. Jerusalem. -2009. The Organization of Ceramic Production During the Transition from the Late Bronze Age to Iron Age I: Tel Batash as a Test Case. Pp. 184-190 in Bachhuber, C. and Roberts, G. (eds). Forces of Transformation: The End of the Bronze Age in the Mediterranean. Oxbow Books. Oxford. -2009. Technological Change and Continuity in the Organization of Ceramic Production at Tel Batash in the Second Millehium BCE. Pp. 213–232 in Rosen, S. and Roux, V. (eds.). Techniques and People. Anthropological Perspectives on Technology in the Archaeology of the Proto-Historic and Early Historic Periods in the Southern Levant. De Boccard. Paris. -2010. The Pottery Assemblage. Pp. 110–145 in Kletter, R., Ziffer, I. and Zwickel, W. Yavneh I. The Excavation of the ‘Temple Hill’ Repository Pit and the Cult Stands. Orbis Biblicus et Orientalis Series Archaeologica 30. Academic Press Fribourg. Vandenhoeck & Ruprecht. Gottingen. -2010. Going to Pot: The Love-Hate Relationship of an Archaeologist and Her Pottery. Biblical Archaeological Review 36/3: 30, 79. -2011. A Tale of Two Houses: The Distribution of Ceramics in Domestic Contexts, Tel Batash as a Test Case. Pp. 85–106 in Yasur-Landau, A., Ebling, J. and Mazow, L. (eds.). Household Archaeology in Ancient Israel and Beyond. Brill. Leiden and Boston. -2013. Beth Shean, Bronze and Iron Ages. In Masters, D., Alpert-Nakahi, B. and Faust, A. (eds). The Oxford Encyclopedia of the Bible and Archaeology. Oxford University Press. Oxford. -2013. with R.A. Mullins and R. Bonfil. Northern Exposure: Launching Excavations at Tell Abil el-Qameh( Abel Beth Maacah). Strata 31:27-42. -2014. with A. Cohen-Weinberger, The Black Juglets. Pp. 403–414 in Garfinkel, Y.; Ganor, S. and Hasel, M.G. Khirbet Qeiyafa Vol. 2. Excavation Report 2009-2013: Stratigraphy and Architecture (Aras B, C, D, E). Jerusalem. -2014. Israel/Palestinian Territories in the Late Bronze Age. in Killebrew, A. E. and Steiner, M. (eds). The Oxford Handbook of the Archaeology of the Levant (ca. 8000 – 332 BCE). Oxford University Press. Oxford. -2014. The History of the Excavations at Tel Bet She’an and the Regional Survey of the Bet She’an Valley. Pp. 234-241 in Wagemakers, B. (ed.) Archaeology in the Land of ‘Tells and Ruins’. A History of Excavations in the Holy Land Inspired by the Photographs and Accounts of Leo Boer. Oxford and Philadelphia. -2015. The Plain Pottery from the Yavneh Favissa, Part Two. In Kletter, R. Yavneh II. The Excavation of the ‘Temple Hill’ Repository Pit and the Cult Stands. OBO. -forthcoming. Aram-Maacah? Aramaeans and Israelites on the Border: Excavations at Tell Abil al-Qameḥ (Abel Beth Maacah) in Northern Israel. in M. Oeming, O. Sergey and I. de Hulster (eds). In Search for Aram and Israel: Politics, Culture, Identity. Mohr Siebeck Verlag, Tuebingen.